by Debbie Miller on December 20th, 2013 - Comments Off on What’s Your Favorite Way to Play? In between all the social media noise, there occasionally comes along a campaign that perfectly aligns with a brand’s mission. This is one of those times! With a collection of indoor and outdoor facilities as well as a variety of customized programs and experiences, Carmel Valley Ranch defines itself as the perfect place to play. 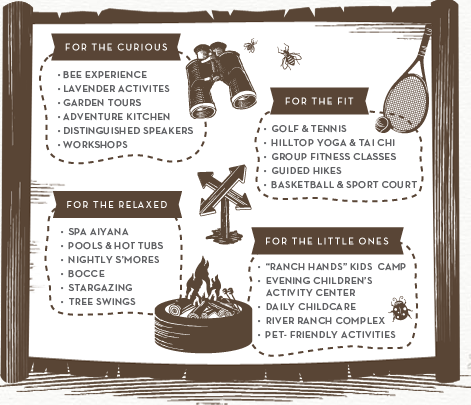 Boasting “all kinds of play, for all kinds of people,” one of their most unique features, suited to both kids and adults alike, is their bee experience. Sixty thousand Italian honey bees diligently forage for the pollen and nectar in every flower at The Ranch. Guests are able to don bee suits and walk into the hives, and experience actually being a beekeeper. To leverage the play theme and encourage individuals to incorporate play into their daily lives, The Ranch is asking fans to capture and share a photo of their favorite way to play. The Instagram-based campaign will begin at the end of January and the winner will be awarded a one-night stay with $100 to play. To enter, users must follow Carmel Valley Ranch on Instagram, then post their play photo and include the hashtag #ranchplay. Follow Carmel Valley Ranch on Facebook to keep up on the launch of and latest updates on the campaign, and, if they reach 10,000 fans by the end the year, they’re offering a complimentary night-stay and $100 activity credit to one lucky Facebook fan as well.